I am not an Arsenal supporter, that would be my brother, but I do respect them, especially the Wenger Arsenal. I first heard the words Arsenal Football Club on a Goals Galore VHS tape that recapped the 88-89 season which came into my possession. Yes that season, won dramatically at Anfield by Michael Thomas. In the early 90’s all I knew about the Gunners was Ian Wright, David Seaman, only because he let in that ridiculous goal against Zaragoza in the 1995 Cup Winners Cup Final, and Tony Adams. 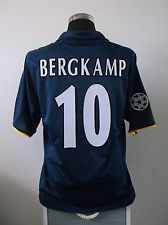 Then the Professor took over, which I didn’t immediately pick up on, (I was more interested in Dennis Bergkamp, who lit up the English game after his transfer from Inter), and in the subsequent years there were epic battles between the Gunners and the Red Devils for supremacy in the English game. The Gunners swept through the first group stage, winning their first three games, including recovering from a 2-0 deficit against Shaktar. The second group stage proved more difficult with Bayern Munich, Lyon and Spartak Moscow. Arsenal scraped through in second place and met Valencia in the quarters. A first half goal from Ayala gave the visitors the vital away goal. The Gunners recovered to win 2-1 but lost 1-0 at the Mestalla to go out on away goals. The following season Arsenal made the second group stage only after a 3-1 win against Mallorca which gave them the tiebreaker. The next phase was very tough and included Bayer Leverkusen (who lost in the Final to Real Madrid), Deportivo (who finished second in the group and lost to Manchester United in the quarters), and Juventus (who finished bottom of the group but won Serie A). The Gunners were in a good position but lost their last two games to Depor and Juventus to get knocked out. 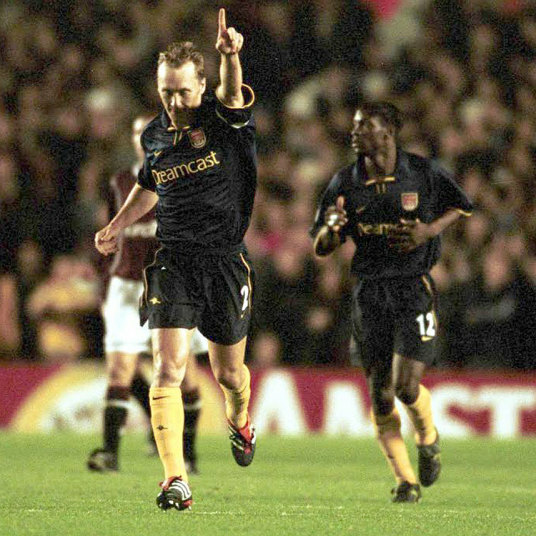 Reviewing the squads from those two years was a great trip down memory lane—Seaman, Keown, Parlour, Viera, Pires, Bergkamp, and Henry—with Adams and Dixon retiring in 2002. I’ve never touched this kit or seen it in the flesh, so I have no idea how it would feel to wear it, but the visual of the kit is stunning. The yellow trim on the collar and sleeves adds just the right accent, while the sponsor is not overpowering, and the club crest provides a sublime touch of class to the kit. According to Historical Football Kits, the blue shirt was worn with yellow shorts and socks, which takes away from the whole look. I would much prefer all navy blue or could probably settle for navy blue shirt and shorts with yellow socks. Think of all the ugly away kits in the EPL era—Liverpool Grey, almost any Chelsea away kit, the NUFC mustard striped travesty and the Everton Pink—and then try to think of the good looking ones—MUFC 93-95, MUFC 97-98, maybe a Tottenham one here or there—and I would argue that this might be the finest away kit of any EPL team ever. Maybe one day, I’ll get on eBay and pick one up, never to wear it in public, but just to have. I’m that shallow and materialistic. I had actually never seen that kit before – a great look. My second kit ever (the first being France, of course) was the 99-01 SEGA kit for the Gunners. Still one of my favorites of the many in my closet.